Welcome to Day #9 of Chocolate and Berries Theme Week. Today's Chocolat Noir - Raspberry 72% Cacao bar was from L'Amourette Chocolat LLC (San Francisco, CA). 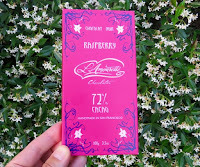 The base 72% chocolate was made from Trinitario (variety)* cacao beans, and it had bold dark, but smooth, even chocolate flavor (with very faint green, coffee, molasses and bittersweet notes). Dried raspberry bits provided subtle bright berry notes in the background. 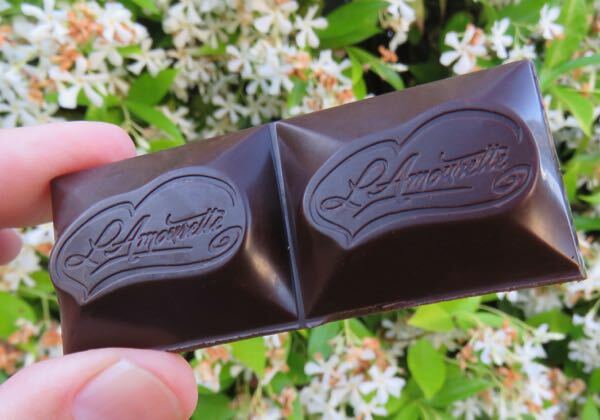 *The three primary varieties of cacao grown are Criollo, Forastero and Trinitario. Criollo generally is more delicate, subtle and flavorful and Forastero more resilient with bolder flavor. Trinitario (believed to be a cross between Criollo and Forastero from the island of Trinidad) has been described as having spice, earth and fruit notes.